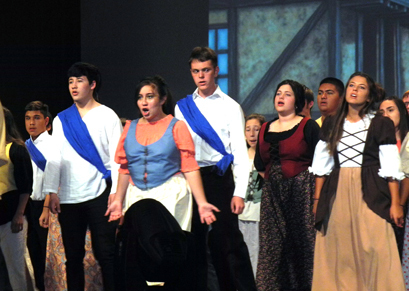 Members of the Artesia High School Varsity Chorale perform selections from “Les Miserables” during a dress rehearsal Monday for the choir program’s upcoming performances of Bulldogs on Revue. This year, the popular annual concert will features songs from favorite Broadway shows, including “Jersey Boys,” “Phantom of the Opera,” “Hairspray,” “Wicked” and more. Performances are scheduled for 7 p.m. Thursday and Saturday at the AHS Auditorium, and tickets are on sale now at Bulldog Pit.